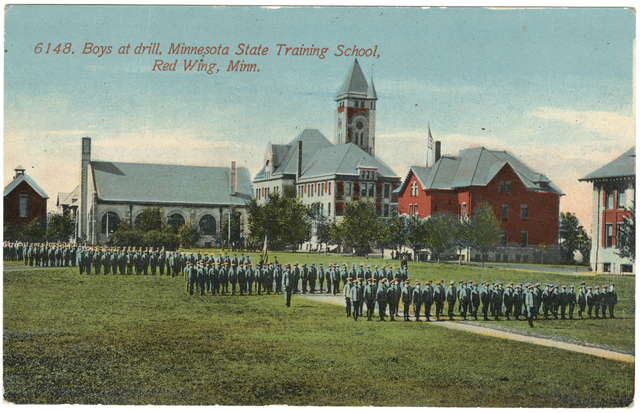 The Red Wing State Training School is the second oldest correctional institution in the state, established as the House of Refuge by an act of the Legislature in 1866. When the school first opened in St. Paul in 1868, it was renamed the State Reform School. Because of crowded conditions and the need for additional buildings, a committee was appointed in 1887 to suggest a new site for the school. A new school was completed in 1891 on a 450-acre site two miles east of Red Wing. It consisted of an administrative building, three cottages, one dormitory, a power house, workshop, and barn. In 1895, the name of the school was changed to the State Training School for Boys and Girls. The provided education and training in an effort to reform delinquent boys (through age sixteen) and girls (through age fifteen). Boys were instructed in trades and exercised in military drills, and girls were taught sewing, cooking, laundering, and other general housework skills. The school had no religious affiliation but conducted religious and moral instruction through clergy of various denominations. The majority of inmates during the first 30 years of the school’s existence were homeless, neglected, and dependent children, mainly boys from the ages of nine to fourteen, and the school often served as a substitute foster home. Many were children of immigrants, and generally very poor. Stealing and unmanageable behavior were the most common reasons for commitment. Later laws stipulated that children be committed when convicted by the courts of a crime, except that of murder, which was punishable by imprisonment. In the early 1900s, the average length of time spent at the school by an inmate was about one year. Entering inmates ranged in age from eight to sixteen years, and remained at the school until they reached age twenty-one, or until discharged. In 1911, the girls at the school were transferred to the Minnesota Home School for Girls in Sauk Centre, and the school at Red Wing became an institution for delinquent boys only, renamed the Minnesota Training School for Boys. In 1979, the name was changed to the Minnesota Correctional Facility—Red Wing. The facility presently serves as the diagnostic treatment center for boys from the metropolitan and eastern regions of Minnesota who have been declared delinquent and committed by the state. Red Wing, Minn.: s.n., 192-? The History of the State Training School, by Orville B. Pung. Records for the Red Wing State Training School for Boys can be viewed in person at the library or ordered online from our Correctional Institution (Prison) Records Request. To order prison records for an individual visit our Correctional Institution (Prison) Records Request. Arranged in two alphabetical series: A-Z, 1915-1955; A-Z, 1955-1963. Institutional case files and commitment papers for boys and girls considered to be delinquents by the state of Minnesota. Initially, inmates were homeless, neglected, and dependent children (mostly boys ages nine to fourteen). In 1895 a court conviction for crime (except murder) became a prerequisite, and beginning in 1911 the facility housed delinquent boys only. Variously titled as "History Book," "Record of Commitment and History of Inmates," and "Statistical Record," with some overlap for 1868-1884, and no record at all for 1893-1897. Includes girls’ histories for 1867-1908. The "Statistical Record" was begun in 1902, apparently when the Board of Control established it as the uniform registration record for all state institutions, and was maintained until 1923. The most detailed of records in this series, it contains, for each inmate, personal description, family data, and information relating to the circumstances of admission, residence, and discharge. Record of parolees and returns (1895-1942) and parole calendars (1920-1935), both with detailed information on inmates paroled each month. Also parole and discharge papers (1909-1951), parole expenses (1930-1939), and a statistical recapitulation of parolees, returns and discharges (1927-1962). Daily records of admissions and discharges from the school; information recorded includes inmate number, name, where received from or sent to, and summary statistics for each month. Also included are registers labeled Adults (1979-1991) and discharge lists (1905-1949). The latter were received from the State Board of Control and list those to be discharged, with brief histories. ​Records containing information on individual inmates, including lists of attempted escapes (1925-1997, incomplete), corporal punishment study files (1925-1945) and books (1933-1948), psychological test results (1927-1940), record of boys released for work (1955-1959), and information on individuals who spent time at both the Training School and the St. Cloud Reformatory (1929-1938). Minnesota Department of Public Institutions Personnel Service Records- Red Wing Training School for Boys, 1934-1938. ​General ledger and corresponding journal (1901-1906), cash book (1909-1916), employee daily time record (1901-1921), and payroll register (1934-1940). ​Manuals and handbooks, newsletters, building fund and capital improvement requests, studies, reports, guides, theses, and various print materials documenting the institution’s programs, activities, and history. Topics covered include case management, rules, employees, security, funding, guided group interaction, positive peer culture, delinquency, sanitation, probation, parole, discipline, operant conditioning, African Americans and Indians at the school, vocational training, and facilities surveys. Included are incomplete series of three school related newsletters: The Centennial Cornerstone, Voices on Campus, and WINGED’ition.